A Beta, a Beta, My Kingdom for a Beta-Reader! Our guest this week goes by many names. To some of us, he is Nanopals, pitiless sovereign of sprints. To others, he masquerades as a lord of the lilliputian lizard, Tiny Pterosaur. And to the readers of his fantastic epic Leylined, he is the inestimable August Samuel Evrard. Without further ado, the Maestro of Michigan, that guy! Just stop. If you’re thinking like that, it’s time for a fresh set of eyes. It’s time for you to read something and get a read back. I promise it won’t hurt. Well, actually, I don’t promise that, but I promise it will be good for you. I was at a convention this past weekend – Legendary ConFusion in Michigan, to be precise, and I was handing out my cards and letting people know about @Nanopals, and #wordsprints and #betabuddy, and almost all the response was positive. But there was a theme amongst those who said “nah.” The idea that your beta-reader had to be “good” or that beta-reading someone else’s manuscript, unless it’s Huge nom quality, is a waste of time. I have some beta-readers who have read my book and I haven’t read theirs, but they are fairly few and far between. I’m not Brandon Sanderson, I’m not Pat Rothfuss, or Margaret Weis. None of us are until we get there. And until we get there, we aren’t any better than anyone else. We need to learn, we need to teach. We need to learn how to do both of those things. We have to open our hearts and minds to the work and opinions of others, no matter who they are or what they think, because no matter what, you are going to learn something. 1. Twitter – The @nanopals account will try to refer a betareader to you, and list you on the blog, @thesprintshack is always willing to rustle up a few, the #betareader and #betabuddy hashtags will find you friends, and anywhere #wordsprint are had you will find people willing to read your book, even without reading theirs. Hell, just ask. I’ve gotten responses from just requesting readers on my personal acct. 2. Conventions – In person is the nuts! Your best chance to represent yourself and your work is almost always in person. Conventions are a great places to meet and greet and pass around your work. From people who will just read, to authors and editors who will recommend workshops or even take your work, there’s a million opportunities at conventions to meet, share and learn. 3. Writing Workshops – whether online or in what we so callously call “the real,” writing workshops are a great forum to meet people and improve your writing. There should always be critique as part of the program, and you will certainly learn whose work you appreciate and what you’re looking to improve. 4. Web Forums – sfsignal, sffworld, nanowrimo.org, fantasy faction, there’s lots of web forums out there for you to lurk around in, sharing stories and getting tips. I’ve lurked around sffworld the longest, and it’s a great community with lots of positivity and helpful folks who are always willing to get in on an amateur (or pro!) anthology. A reader is always right, but not always for the right reasons. Your friends are valuable sources of just plain readers. Writers have agendas when they read your work, they’re comparing their skills to yours, your story to theirs, efficiency of prose and all that. Which is all very good, but it’s not writers that are going to be buying your book (unless you’re writing about writing, ad nauseum), it’s readers. Maybe a lot of readers with aspirations of being writers, but there’s a difference. Until you start writing for yourself, you don’t have anything to compare those books to, so you’re still just enjoying them, if only through constant pangs of jealousy. Don’t be afraid to approach anyone and everyone to read your book; the fact is, you’re only going to be alienating a small population of your potential readership if you ask everyone you know and meet to read it, and it’s terrible. Most of your buyers and readers you will never meet, and they’ll never meet anyone who read that awful first draft. Guys, I know you’re worried. I know you’re scared, and anxious. If you’re not, well godzilla <oops!> you, how the <hey-o!> do you stay so <yikes!>ing calm all the time?? But let me tell you that it only gets easier, it only gets better. The more you give your writing out, the more you can be confident of your own opinion of your work. You’ll be better, know more, and be more confident. All because you forced some sucker – I mean got a good friend – to read your MS. I don’t sleep when I’m nervous. I only eat. 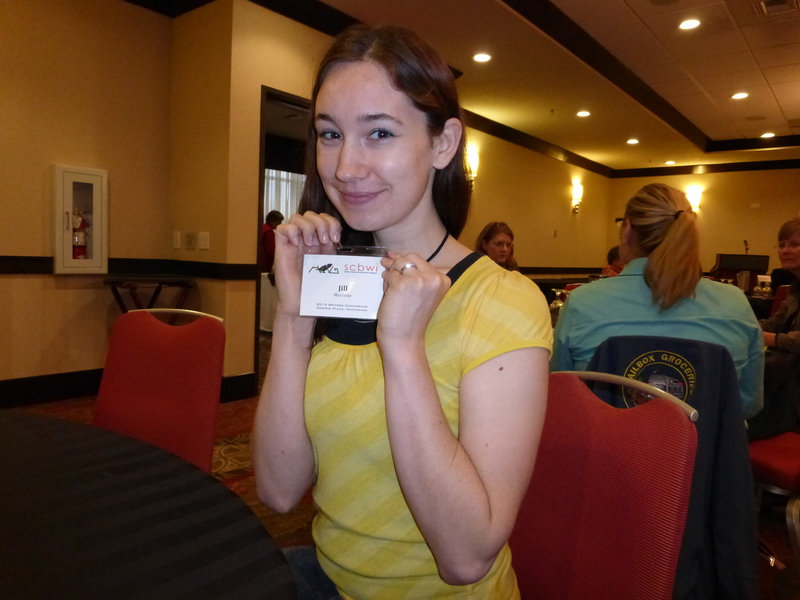 This is me about to eat my name badge. Alaska Writers Guild Conference 2013 was AMAZING! I wish I could draw little stars and rays of glory all around that word, but I can’t so you’ll have to imagine them. The conference was pretty great. I had a blast and met some fantastic people that I regularly left my laptop and writing notebook with- that’s how you know I would trust them with my life. So much greatness happened that I’m going to divide the conference into multiple posts, just for sake of detail. If I put the level of detail I want all in one post, I’m afraid nobody would read it. So! This week, Part One- the wacky hijinks of the first day. At some point this week, I’ll add a bonus post (or two?) about the fun stuff that happened the rest of the conference. And next week I’ll tell you about some of the things I learned. The adventure started at 5:30 Friday morning. My alpha reader, Mary Tait, and I were both too giddy to sleep and made the 375 mile drive with loads of giggling, squealing, and junk food. I had a Friday workshop with Lisa Cron, author of Wired for Story, and I was super excited, so I had Mary drop me off directly at the hotel before she took off to do her own thing. I went into the hotel and wandered around, and looked at books and peeked in the conference rooms, and went into the bathroom and clumsily applied makeup. (Someone told me that, as a female professional, nobody will take me seriously if I don’t wear makeup. I still don’t know if I believe that person, but I was too afraid to risk it. This is how desperate I was to be taken seriously.) Really, though, I was just goofing around. I won’t burden you with my inner monologue, but it mostly included the words “I’m here, I’m really here!” repeated infinitely. But by this point, I was starting to wonder where everyone else was. The workshop was still twenty minutes out, but I figured people would be showing up early for registration. Come to think of it, where were the people doing registration? By now, he probably thought I was a crazy person, because the manager was now lingering at his shoulder, and another burly desk man had stepped closer. You know, in case I tried to attack him with one of the plastic bananas or something. Writers are like that. So at this point, I pulled out the conference schedule so I can PROVE to him that there’s a conference today at one and then they’ll knock this junk off and tell me where it is because this IS NOT FUNNY. And I was right. There WAS a workshop at one. I frantically texted, phoned, and psychically summoned Mary to come drive me across town to where the workshops were ACTUALLY taking place. But she didn’t answer. Nary a whisper of my beautiful chauffeur. I was getting desperate. Maybe I’d take a taxi. Would that take too long? Maybe I should just hop in the first car that pulls up and demand they take me to the workshop. What if he had a hockey mask on? Aaaargh! Then a car pulled up and I prepared myself to confirm once again my utter insanity to the hotel staff that was very well still watching me on their security cameras. But I thought I kind of recognized the guy behind the wheel, so maybe he’s Mormon or something and not a serial killer. Two people came out of the hotel to climb into the car. I definitely recognized the guy, but I wasn’t sure where from, and then Lisa Cron herself piled into the back of the car. That settled that- time to be manic again. Now I was grinning like she’d just proposed to me. My insides were melting. “Really?” And my voice kept rising in pitch. I realized I was sounding like an idiot again before the very people I least wanted to sound like an idiot to. Then she asked me about the premise for the book, the world I’ve built, the methods I used, and I magically transformed into a smooth-talking professional. She told me about some of her theories, about her clients, about her thoughts on world building, which I love to no end. Lisa Cron is so wonderfully disarming, so perfectly accessible, and I couldn’t help but feel comfortable with her. Next thing I knew, we were talking about crazy adventures from my childhood, about being the only girl growing up with four brothers, about my military father and our constant moves around the country. She was just so fun, so human. It was wonderful to talk to her. She and Jim Misko (the founder) and Robert Masello (the other author and keynote speaker, who is, by the way, absolutely hilarious) were all so nice to me, that day and the entire conference. They’re all fantastic people and they saved me from suicide by serial killer. That had to be the most serendipitous day of my life. Really, how did I get so stupid lucky? And furthermore, this was only the first day of the conference. Things stayed awesome.